Hannah received an Office of Undergraduate Research & Creative Inquiry Research Grant. Great News! Marissa received a Johnson Cancer Research Award to continue her research on PP1-interacting genes for the Spring 2019 semester. Read about it here. Congratulations! Our paper at Molecular Biology of the Cell (MBoC) is online! Please read it here or here. Thank you to the hard work of all three first authors: former lab member Ketki Sawant and current lab members Yujun Chen and Nirupama Kotian. Jocelyn attended the Midwest Society for Developmental Biology meeting in Cleveland, OH, and helped organize the Education Workshop “Publish or Perish”. Welcome to Biology Graduate Program rotation student Emily Burghardt! Dr. Mark Peifer visited the Division of Biology (KAWSE ADVANCE Distinguished lecture series). The lab had productive discussions about Rap1, adhesion proteins, and the cytoskeleton. A new semester starts! Welcome to returning/new undergraduate research students: Carmen, Hannah, Manuel, and Marissa. Yujun and Jocelyn returned to UCSB to continue their work to learn advanced live imaging, in vivo reporters and photomanipulation of cells, and light sheet imaging. Kevin moved on to start an MBA in San Antonio, Texas. We’ll miss you, but wish you the best of luck! Carmen Del Real returns to the lab, now as a Bridges/DSP Scholar. Welcome back! After a trip back home to Sri Lanka, Oshadhi will move to Kansas City to start graduate school in August. We wish her the best of luck. Yujun and Jocelyn spent time in Denise Montell’s lab as part of her NSF EPSCoR Track 4 Fellowship. They learned how to perform live in vivo FRET imaging and analyses, confocal time-lapse live imaging, and started to use light sheet fluorescent microscopy. The Montell lab was very welcoming and helpful! Special thanks to Joe Campanele and Abhinava Mishra in Denise’s lab and Ben Lopez in the NRI-MCDB Microscopy Facility for training. Oshadhi will be joining KU-Medical School (Kansas City) for PhD graduate studies in August 2018. Congratulations! Nirupama received travel grants from the KSU Graduate College and the BGSA (Biology Graduate Student Association) to attend and present her work at the 2018 Annual Drosophila Research Conference in Philadelphia, PA, in April. Congrats!!! Oshadhi continues in the lab, now as a part-time technician. We are excited to have her join the lab in a more formal capacity. Undergraduate research student Marissa Komp received the Johnson Cancer Research Center Cancer Research Award (CRA). She is one of 50 K-State students this year to receive the award. She will continue her research in the lab for the Spring 2018 semester. Kudos! Three undergraduate students in the lab have been selected for the McNair Scholars Program: Marissa Komp, Adelina Parral and Loan Tang. Congratulations! Read more here. The lab attended the Midwest Drosophila Research Conference at Allerton Park and Conference Center in Monticello, IL. Yujun gave a talk and Nirupama presented a poster. It was a great meeting with lots of interesting science. Jocelyn received one of the brand-new NSF EPSCoR fellowships that “will provide 30 non-tenured researchers with fellowships, partnering them with premier research centers and enhancing their ability to work at the frontiers of science and engineering.” Jocelyn and postdoctoral fellow Yujun Chen will go to the University of California at Santa Barbara to Dr. Denise Montell’s lab where they will learn new imaging techniques to visualize migrating cells and manipulate protein functions in live cells. Read more about it here and here! Luke Messer joins the lab as a first-year doctoral graduate student. Welcome to K-State and to the lab! It was a summer of hard work and successful research for our undergraduate researchers. Carmen learned a lot helping Yujun screen for candidate PP1 interacting genes. She presented the results of her genetic screen at the RiPS Poster Session. Adelina had a great start to her ongoing research project in the lab. She presented her research on the Drop Out gene to her fellow Bridges students in early August. Adelina returns for the Fall 2017 semester through the Developing Scholars Program. Several new students/interns are working on research projects this summer. Welcome to Carmen Del Real (RiPS Program – KS-LSAMP), Adelina Parral (Bridges/Developing Scholars) and Oshadhi Athukorala Arachchige! A warm welcome to our new lab manager Kevin Preuss. Undergraduate researcher Loan Tang received a Gilman scholarship to study in Vietnam and is featured in K-State Today. Congratulations to Loan! Jocelyn gave a seminar on May 11th at the Stowers Institute in Kansas City, MO. She had a wonderful time interacting with her host, Paul Kulesa, and his lab. Jocelyn visited the University of Iowa Anatomy and Cell Biology on May 5th – thanks to Tina Tootle for hosting a fun and productive visit. Yujun presented a poster at the 2017 Annual Drosophila Research Conference in San Diego, CA, March 29-April 2. Yujun received word that he will be receiving a K-INBRE Post-Doctoral Award. Great news! Undergraduate Marissa Komp is a new intern in the lab. Loan Tang presented a poster at the K-INBRE symposium in Manhattan, KS, Jan. 14-15. Nice job! Lauren continues in the lab as a research student. Jocelyn presented a poster at the Annual ASCB meeting in San Francisco, CA, Dec. 2-7. Pralay finished his productive science visit on Dec. 20th and headed back to India. Jocelyn visited the University of Kansas on 9/19 where she presented a seminar – it was a great visit, meeting with KU biologists and students. Thanks to Rob Ward for hosting the visit. New interns Lauren Knox and Heather Foy have joined the lab – welcome! A very special welcome to Dr. Pralay Majumder, visiting scientist from Presidency University (Kolkata, India). He will be here all fall to learn techniques and do new experiments. Undergraduate Loan Tang is a K-INBRE semester scholar. Congrats! New graduate student, Nirupama Kotian, has arrived and starts her studies this month. Welcome to the lab! New postdoctoral fellow, Yujun “Eugene” Chen, has joined the lab. Welcome! Our recent paper (Aranjuez et al., Mol Biol Cell 2016) has been recommended in F1000Prime. Jocelyn attended the TAGC 2016 Genetics Conference, which included the Annual Drosophila meeting. She presented a poster on “Inhibition of Protein Phosphatase 1 activity switches border cells from a collective to single cell mode of migration.” Lab alumnus George Aranjuez also attended. SUROP (Summer Undergraduate Research Opportunity Program) student Kristen Hylen (Benedictine College, Atchison, KS) presented her research at the end of summer research forum. Congratulations on a job well done! Jocelyn attended the Gordon Research Conference on “Signaling by Adhesion Receptors” at Bates College in Lewiston Maine. She presented a poster and short talk on Ketki’s work, titled: “Detachment Versus Cohesion: Novel Roles for PDZ-GEF and Rap1 During Collective Cell Migration.” It was a great meeting, with lots of ideas and interactions amongst scientists at all levels. Dr. Ketki Sawant graduated at the 2016 Cleveland State University graduation ceremony at the Wolstein Center. She is the first student in the McDonald lab to go through the hooding ceremony! Former lab member, George Aranjuez, won the Doctoral Excellence in Genetics and Genome Sciences award from Case Western Reserve University. Congratulations on this major honor! We participated in the GROW workshop to introduce 6th-8th grade girls to innovative science (click on link to see pictures of the event). The lab presented “Glow in the dark fly: lighting up cells to learn about the body.” Students looked at fly mutations and glowing body parts using GFP (green fluorescent protein) and RFP (red fluorescent protein). Welcome new lab member Maria ‘Kitty’ Lawas, who joined our group as a Research Assistant/Technician! Two new lab prep/fly food assistants have joined our group and Dr. Erika Geisbrecht’s group: Fawwaz Naeem and Nathan Tolle. Welcome! The McDonald lab is looking for a postdoctoral fellow (“Research Associate”). Please see the Division of Biology employment page, or click Postdoc Ad, and follow the directions on the ad for details on how to apply. Welcome to new undergraduate research interns Loan Trinh and Erin Feeley! Jocelyn met with lab alum Pralay Majumder on her visit to her in-laws in India. He took an overnight train from Kolkata to Bhubaneswar to chat science over tea. Ketki Sawant successfully defended her PhD thesis at Cleveland State University. Congratulations Dr. Sawant! The McDonald lab is recruiting multiple people to join our team! Interested graduate students can apply to the Division of Biology or the Genetics program at Kansas State University. Students interested in the lab can contact Dr. Jocelyn McDonald by email (jmcdona (at) ksu.edu) before sending their application. Please include specific information about your research interests and how studying in the McDonald lab will further your career plans. Interested undergraduate students, postdoctoral associates, or technician applicants are welcome to contact Dr. McDonald with research interests (i.e. “why are you interested in the lab?”), current CV, and contact information for three references: jmcdona (at) ksu.edu. The McDonald lab has moved to Kansas State University, Division of Biology! New lab funding from the National Science Foundation (NSF IOS 1456053). We will be recruiting undergraduate students, graduate students and a technician at Kansas State University. We have an opening for a postdoctoral fellow. Interested applicants should contact Dr. McDonald with research interests, current CV, and contact information for three references: jmcdona (at) ksu.edu. Information about the Division of Biology and the graduate programs can be found at: http://www.k-state.edu/biology/index.html. The McDonald and Lathia Labs received a multi-PI R21 Exploratory Research Grant award from NCI to use Drosophila border cells and patient-derived glioblastoma cell lines to identify genes responsible for collective cell invasion in glioblastoma (1R21CA198254-01). George Aranjuez successfully defended his PhD thesis. 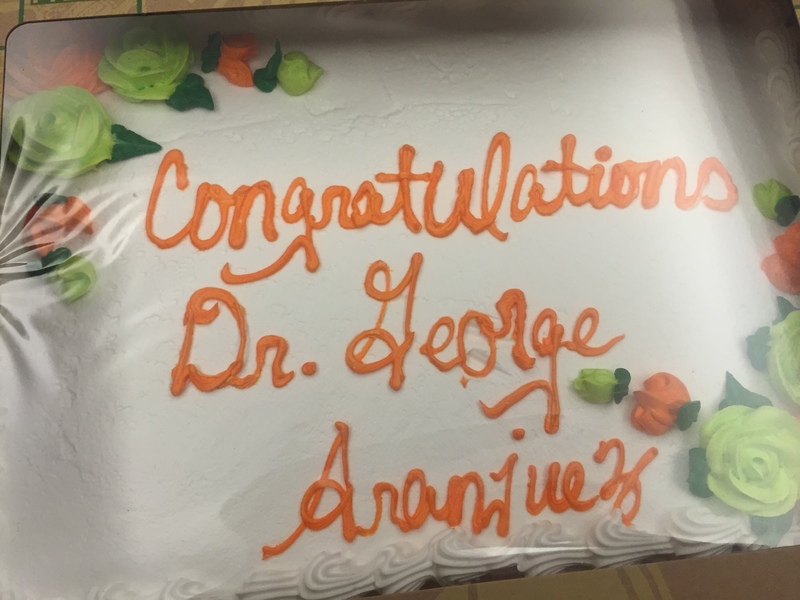 Congratulations Dr. Aranjuez and good luck as he moves on to a postdoctoral position at the Burnett School of Biomedical Sciences, University of Central Florida! Ketki Sawant gave a talk at the Buckeye Cell Biology meeting in Columbus, Ohio. April 24, 2015. Congratulations! The McDonald Lab attended the 2015 Annual Drosophila Research Conference in Chicago, IL. March 4-8, 2015. George presented a poster (203A) and Ketki presented a platform talk (115) on Saturday, March 7 in the Cell Biology & Cytoskeleton I Session. The McDonald lab participated in the second annual LRI Science Day! A local group of 6th, 7th and 8th grade students came to the LRI for a day of Science. We gave a 20 minute demonstration called “Glow in the Dark Fly”. Students saw movies of our fluorescently-labeled moving cells and flies with glowing red eyes or green abdomens. Click link for a summary of the event. Ketki Sawant won a Conference Travel Award from the CSU Graduate College, which she will use to attend and present her research at the Annual Drosophila Research Conference in Chicago, IL. Kudos! George Aranjuez gave a talk at the 2014 Midwest Drosophila Conference on Nov. 1st at Allerton Park in Monticello, IL. He won a best talk award. Congratulations!